For the next few nights the moon will be visiting some of the highlights of the Fall sky. This is the view on Thursday night, October 4. In its monthly trip around the Earth, the moon often passes close to many interesting objects. These juxtapositions are often beautiful to look at, and help beginning stargazers to find some of the sky’s hidden treasures. Over the next few nights, the moon will visit some of the fall season's prettiest night sky objects. Tonight (Oct. 3), the moon will be close to the Pleiades, the brightest star cluster in the sky and one of the nearest deep sky objects to us, only 410 light-years distant. The Pleiades is a bright cluster of newborn stars. “Newborn” to astronomers means that these stars are a mere 100 million years old. Because of its youth and young age, this cluster is extremely bright, visible even when close to the moon. 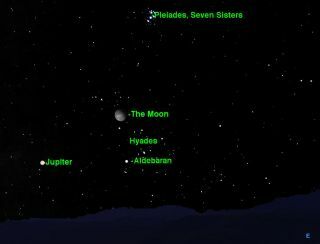 Look for the Pleiades just above and to the left of the moon as it rises around 9 p.m. local time. Tomorrow night, (Thursday, Oct. 4), the moon rises about an hour later, so look for it around 10 p.m. local time. It will have moved so that it’s perfectly placed half way between the Pleiades, on its right, and the bright planet Jupiter, on its left, and just above a second bright star cluster, the Hyades. The Hyades is a much older cluster than the Pleiades, and its individual stars are not as bright, despite the fact that it is much closer to us at 150 light-years distance. Its stars are spread over a much larger area of sky, so that the cluster as a whole does not seem as bright as the Pleiades, even though the stars add up to a greater overall luminosity. The bright red giant star Aldebaran appears to be embedded in the Hyades cluster, but this is an optical illusion. In fact Aldebaran is less than half the distance to the Hyades, only 65 light-years away from us. On Friday night, the moon will rise an hour later still, around 11 p.m. local time, and will have moved to the left of Jupiter. Although these objects are grouped close together in our sky, it’s worth realizing that they are in fact spread over a great depth of space. These distances are best measured by the time it takes light to traverse them, light travelling at 186,000 miles per second (300,000 kilometers per second). The moon is closest, only a light-second away. Jupiter is 38 light-minutes away. The stars are at vastly greater distances, measured in light years: Aldebaran at 65 light-years, the Hyades at 150 light-years, and the Pleiades at 410 light-years. But even these vast distances shrink to insignificance when measured against our Milky Way galaxy, 300,000 light-years across. Editor's note: If you snap an amazing photo of the moon and the Pleiades, or any other night sky sight, and you'd like to share for a possible story or image gallery, send images and a description (including location) to managing editor Tariq Malik at tmalik@space.com.